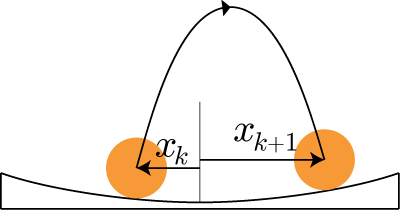 The Blind Juggler is a great way to illustrate basic concepts of dynamical system theory. You may learn more about some of the key concepts related to the juggling machines in short tutorials that use simple toy examples to explain the material. Linear Stability Analysis: Learn more about the tool we used to find the shape and motion of the paddle that make sure the ball does not fall off. Linear vs. Nonlinear Systems: Learn more about the differences between linear systems and nonlinear systems. In engineering, we often analyze systems by approximating them with linear systems, because they are straightforward to analyze. However, most physical systems are nonlinear, which are less straightforward to analyze and that have some amazing properties. Controllability: Learn more about the concept of controllability, which can be used to find out if a robot can be controlled to do what we want or not. This concept is an important aspect of the research with the Cloverleaf Blind Juggler.